Samford University will celebrate the Christmas season with a series of events that will be of interest to students, alumni and the general public. Some of the programs have been enjoyed by several generations of Samford students. What may be one of the school’s oldest holiday traditions, Christmas Around the World, will be presented Thursday, Dec. 3, at 10 a.m. in Reid Chapel. The program, hosted by the departments of World Languages and Cultures, Classics, and Religion, offers music and scripture readings in 20 languages. The beloved tradition, which began in the 1950s, is open to the public. Brooks Hall auditorium will provide overflow seating when Reid Chapel is filled. Christmas Around the World will be shown via live stream. Two popular longstanding traditions, the Hanging of the Green service and Lighting of the Way ceremony, will be on Thursday, Dec. 3. Hanging of the Green, based on an old English custom, will be in Reid Chapel at 6 p.m. The service will include the lighting of the Advent wreath, decorating a Chrismon tree and music by the University Chorale. Fourteen senior honorees will lead the service, which will be shown via live stream. Philip Poole, Samford executive director of communication, his wife, Shellyn, and their family were chosen as this year’s family to add a Chrismon ornament to the tree. The Lighting of the Way will begin at 7 p.m. on Centennial Walk. Samford First Lady Jeanna Westmoreland will read the Christmas story, and singer/songwriter Steve Moakler will perform. A newer Samford offering, albeit one that celebrates a 2,000-year-old celestial event, is the Star of Bethlehem presentation in Christenberry Planetarium. The shows, starting Dec. 3 and concluding Dec. 20, will be offered at a variety of times during the day and evening, and on weekdays and weekends. This year’s program will explore the star from astronomical, biblical and historical perspectives, and offer a prayerful meditation in preparation for Christmas. Tickets are $8 and also may be purchased at the Harrison Theatre box office or by phone at 205-726-2853. The A Cappella Choir will fill A. Gerow Hodges Chapel with prayer, liturgy and song during a Service of Lessons and Carols Friday, Dec. 4, at 5:30 p.m. The special Christmas program is part of the 45-member choir’s monthly choral vespers series. The public is invited free of charge. Philip Copeland directs the internationally recognized award-winning choir. Samford’s Birmingham Young Alumni Board will host a Christmas party for recent graduates (2005–15) on Tuesday, Dec. 8, 6–8 p.m., at the home of Samford President Andrew Westmoreland and his wife. The event is free and will include heavy hors d’oeuvres. To register, click here or call 205-726-4065. 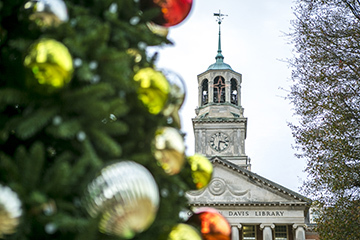 The Samford Alumni Association invites all families to a Samford Family Christmas on Saturday, Dec. 12, 2–4 p.m., in Harry’s Coffeehouse in the university center. Grandparents, parents and children of all ages are welcome. Kids’ activities include cookie decorating, Christmas crafts and photos with Santa. Spike, the Bulldog mascot, will be on hand. The event is free of charge. About 100 happy participants attended last year’s inaugural Family Christmas. To register or learn more, click here or call 205-726-4065. Samford’s Legacy League will host its fifth annual Christmas Home Tour on Thursday, Dec. 10. The popular holiday event will showcase five homes in Mountain Brook and Vestavia Hills, Alabama, ranging in style from traditional to contemporary. Proceeds will help provide life-changing scholarships for students with significant financial need. The five featured residences include the Samford President’s home. At that stop, visitors may shop at a holiday gift market and enjoy hors d’oeuvres. Homes will be open 10 a.m.–2 p.m., and again 4–8 p.m. Tickets are $25 through Dec. 8 or $30 at the door during tour hours. Details are available at 205-726-2247.